Are you embarrassed to go out because of your acne or bad skin? Maybe you are tired of layering on heavy makeup to hide your wrinkles and age spots? Tackle the problem head on with the Davita BL 100 BeautyLite. 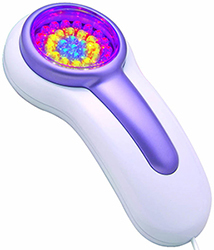 This stylish, compact, handheld acne light therapy device is perfect for beauty treatments at home. It’s simple and easy to use and also incorporates a spectrum of different lights, all of which have different effects upon the skin. It is a well-known medical fact that phototherapy which uses red and blue light can considerably improve your skins condition, not just from the surface but from the inner layers too. Particularly effective light treatment for acne, the Davita BL 100 BeautyLite has the appropriate wavelengths required for a medical effect. The beauty of the handheld device is in the fact you can focus on particularly problematic areas. Your acne may only be centred on your cheeks or forehead so the handheld device allows you to focus your attention on these problematic areas! So much cheaper than costly salon treatments you can indulge in your healing light therapy from the comfort of your own home, or take it with you when you travel so you never have to miss out on a treatment. What do those beautifully coloured lights actually do? Each colour, although very aesthetically pleasing and pretty, has its own unique purpose in helping rid your skin of unsightly acne, wrinkles, age spots and fine lines. The Blue Light: Stimulates oxygen production in clogged pores helping to keep the skin clean which inhibits the growth of bacteria. Because the blue light boasts an antibacterial effect it can help to eliminate the cause of infection within a pore subsequently banishing acne. The Red Light: Penetrating deep into the dermal layers, the red light stimulates healing and the repairing of the tissues. It helps to stimulate blood flow and because of this, inflammation can fade away quicker and the skin can regenerate faster. Harmless to the skin and eyes if you treat your skin for 15 minutes a day, 5 times a week you will notice a substantial difference after only 2-3 weeks. The Yellow Light: This light has a purifying effect on the toxin processing function while helping to strengthen the endocrine functions. The yellow light can smooth the skins surface and help to lighten scars, acne spots and flatten wrinkles. The Green Light: Blue and yellow combined not only produces a beautifully tranquil colour, it has a sedating and balancing effect on the body and mind and helps to calm inflammation and swelling of the skin. The Orange light: Red and yellow combined produces the warm glow of orange light, which helps to increase the blood and lymph circulation helping to remove waste from the skin and rejuvenate cells. Billions of pounds are spent on acne products each year and on average, a woman will spend more than £18,000 on her face in a lifetime so stop spending your cash on temporary fixes and opt for the permanent solution. Perfect for those who have busy lives and need a long lasting solution to their skin problems the Davita BL 100 BeautyLite will deliver. Compact, easy to use and completely safe you can use it from home or on the go so your bad skin becomes a thing of the past.